Grasshoppers are the insects which are famous for their long jumps and making a chirping sound. They have adapted themselves very well for their survival. They have an excellent camouflage, that can blend them almost completely in the surroundings of their habitats. There are about 11,000 different species of grasshoppers that are living around the world. Grasshoppers have a long body with six legs. Their back legs are large which help them to jump very high. Their body is divided into 3 parts; a head, a thorax, and an abdomen. They have a strong exoskeleton which protects their soft body. They have a pair of large wings at their back and a pair of smaller wings on the front. Grasshoppers have a wide range of colors that change from species to species. 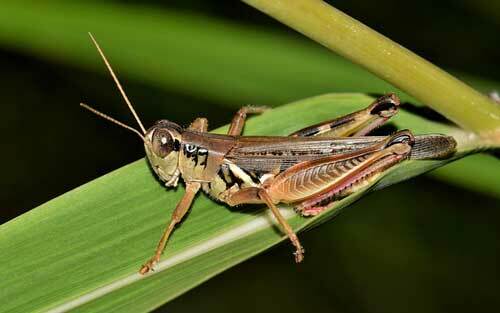 Grasshoppers can eat both plants and small insects. It depends on their location what they will eat. Grasshoppers are very good hunters, their camouflage helps them a lot to succeed in the hunt. Many species of grasshoppers love to eat human-produced crops, e.g. wheat. They cause serious damage to the crops and sometimes eating all the crops. Grasshoppers are one of the insects that are found all across the world. They are found in forests, grasslands, swamps, deserts, and mountains. Grasshoppers population is stable. They are not endangered. In many countries, people eat some species of grasshoppers. They can jump 20 times as high as their body length. 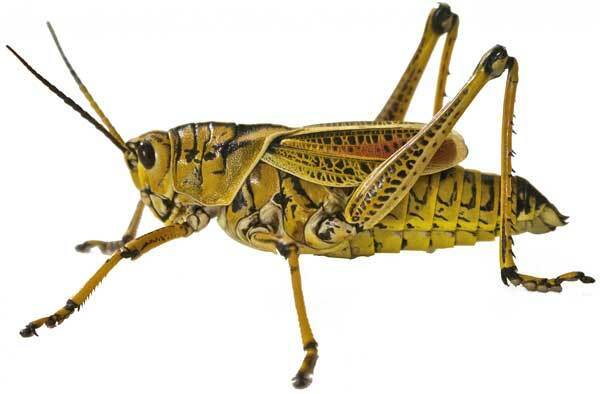 Locusts are the species of grasshopper that cause 1.5 billion dollars of damage in the US alone by destroying crops. Some species of grasshopper make singing noise by rubbing their back leg with one of the hard front wings. Abdul Wahab, "Grasshopper," in Science4Fun, April 13, 2019, http://science4fun.info/grasshopper/.